Nice is the fifth largest city in France, but in my mind it’s the most important after only Paris. Nice is not only a beautiful Mediterranean city with a lot to see and do; it is the hub for the French Riviera. 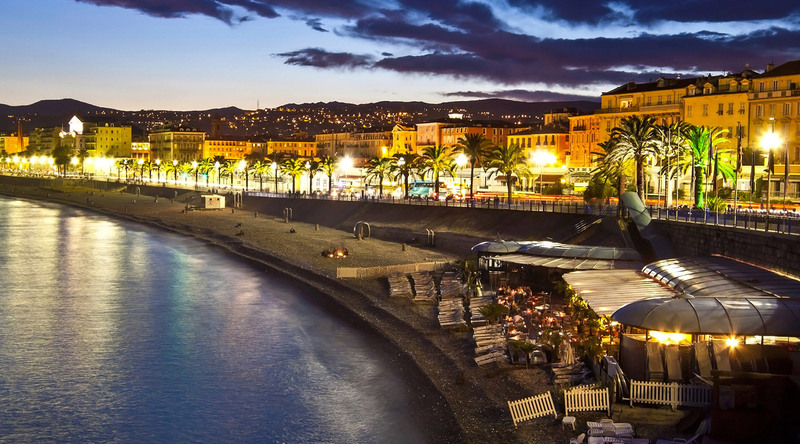 Nice brings the world to the South of France and gives it reason to stay a while. Nice is often overshadowed by its glitzy neighbors: Monaco and Monte Carlo and their aristocracy; or Hollywood (and my) favorite Cannes; or champagne jet-set favorite St. Tropez-but Nice can hang! Nice offers a lot of what the others don’t. Nice is a city for all budgets. Nice is a place where you can feel comfortable walking around Promenade Des Anglais or in the old quarter around Place Garibaldi over to the quickly improving port area. Restaurants and bars are easy to find but hard to leave. For over a century, Nice has been a second home to many rich Europeans. The English couldn’t stay away from the Mediterranean climate and who could blame them. The weather is pretty much perfect all year round. My only real issue with Nice is that their beach is rocky and not sand. You have to go out of Nice to find sandy beaches but that’s not so bad either because then you can discover the little hidden gems that surround Nice. Whether they are beachside or higher up in the hills above nice-you can’t go wrong. My personal favorite spot to visit around Nice is Saint-Paul-de-Vence. I have to give credit where it’s due as I had never heard of it until I did a shore excursion from my Azamara cruise last fall. I fell in love instantly with this amazing little picturesque walled city. It’s only about 20 minutes or so from Nice so be sure to make your way up there-you will not regret and it will make all your Facebook friends jealous! My favorite way to see Nice itself is on foot, but I also recommend checking out the aforementioned neighbors. Driving along the French Riviera and seeing the trail of the rich and famous is a lot of fun and something that should not be missed. Just make sure you come back to Nice and scour the Old Quarter for your perfect little restaurant-and believe me you’ll have plenty of choices. The Niçoise and Italian food are almost always fantastic… just stay away from restaurants with pictures of the food - that’s a general rule, not just for Nice! Whatever you do, enjoy Nissa La bella! A five-night Monaco Grand Prix voyage in May 2015. An eight-night Classic Mediterranean voyage in October 2015. A fifteen-night transatlantic voyage in April 2016.